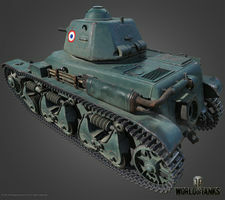 The Renault R35 is a French tier 2 light tank. The most massively produced WWII French light tank. Developed in 1934 on a request from the army for infantry support. A total of 1,630 vehicles were manufactured from 1936 through 1940. The Renault R35 leads to the AMX 38. Whereas the H35 arguably has, arguably, the better firepower, the R35 has, arguably, the better armour profile. This allows the R35 to be slightly more survivable than the H35. But it's playstyle is virtually identical. The only thing that carries over from the Renault FT is the 25 mm Raccourci mle. 1934 gun. Mount it immediately. Start by researching the Renault V4 engine, if you don't already have it. Next research the upgraded suspension for increased weight capacity and slightly faster traverse. This is necessary if you want to add equipment, but is otherwise optional. Research the ER 54 radio so you'll have a better idea of what's going on around you. Lastly research the 37 mm SA38 gun and the APX-R1 turret for slightly higher view range and a few more hit points. The French light tank development after WW1 consisted of a number of improvements to the original Renault FT. After a long line of experiments (one of the results of which was the Renault NC light tank), the French Infantry Command decided to develop a tank in the 12 ton category. 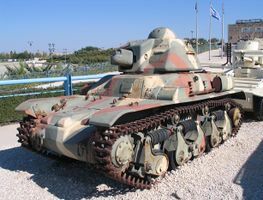 This program culminated with the development of the 14 ton Renault D1, which was – size- and weight-wise – more like a medium tank.The D1 was plagued by a number of technical issues and was never a serious Renault FT replacement – 160 were made, which was only a drop in the sea of 3500 Renault FTs. 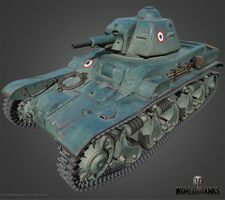 The Infantry Command had to find another solution and the result was the R35 by Renault, a light tank that played a sad role in the French defeats of 1940. One of the most important reasons for further development of French tanks were the new discoveries and improvements to the armor-making technology. At that time, the armor plates were attached to each other usually by riveting. As far as bullet protection went, riveted armor was quite fine, but making it more resistant in order to withstand more serious hits was complicated. The first nation to partially utilize welding in armor assembly were the Germans in the 1920s, but since their tank program was still a secret by then, no-one actually knew about it. Another alternative approach to armor creation was casting. Even the first Renault FT’s had cast hull parts and turrets, but for a number of reasons this technology did not immediately become widespread. The French returned to it only in the early 1930s and even then it was limited to turrets. Using cast hull parts was actually a promising technology with the perspective of simplifying hull production – and cast hull parts were much sturdier than equal parts assembled by riveting. The first people who proposed to en masse introduce casting to tank production were the engineers from the Hotchkiss company from St.Denis (today, this town north of Paris is in fact one of the Parisian suburbs). Hotchkiss was a massive arms manufacturer at that time, introducing its first combat vehicle as early as in 1909 – but that was an armored car, Hotchkiss wasn’t initially interested in tank manufacturing. Nevertheless, the casting procedure technology, as proposed by the Hotchkiss engineers, caught the eye of the Infantry Command, since the technology was more suitable than anything else for 30mm armor or thicker. In addition to the technology itself, the Hotchkiss company also proposed to make a tank that the French infantry sorely lacked. Basically what the military ordered was in effect to be a better protected Renault FT, capable of withstanding heavy machinegun fire. This was not an accident of course – the infantry tactics haven’t practically changed since the First World War until the 1930s. The successes of Renault FT from 1918 created an illusion that using light infantry tanks en masse was the most effective way of tank use. This logic implied that the more tanks were produced, the better – but at the same time the wartime military budgets were cut drastically. Under these circumstances, large numbers of tiny cheap 2-man crew infantry tanks with relatively thick armor looked really attractive to the army. The fact that the rest of the world at that point started preferring speed and started considering tanks to be a separate military branch instead of just the means to support the infantry was something the French tacticians either completely missed, or wilfully ignored. 14 companies in total reacted to the specifications from 2.8.1933, Renault being one of the first ones. 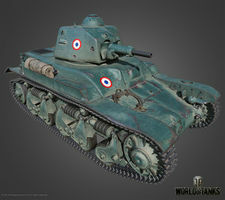 At that time, Renault was the workhorse of the French tank industry and worked on a number of projects in parallel. One of them was the Renault VM tankette, built for cavalry used and later accepted in service under the designation of AMR-33. At the same time, Renault worked on yet another cavalry vehicle – Renault VO (the second project to bear the same name). These prototypes tested the new Renault concept of a light vehicle with transmission located in the front of the vehicle, which became the foundation for Renault’s new infantry tank. By the way, this concept was “borrowed” from the British – Renault VM was based on the Renault UE tractor, which in turn was based on the famous British Carden-Loyd tankette. This new light infantry tank by Renault received the Renault ZM designation in 1934 when the development begun. The designers didn’t opt for any novel solutions and reworked the older Renault VM concept instead. The tank received a hull consisting mostly of cast parts and initially it was quite like a bloated cavalry tankette. The drive sprocket and transmission were located in the front of the vehicle, the combat compartment was moved a bit to the back. The driver was located in the hull, his position was shifted a bit to the left from the vehicle axis. This approach allowed the French to make the vehicle really compact. It was for example just a bit longer than the original Renault FT. Regardless of the combat compartment shift to the back, the engine was not located (unlike in Renault VM) directly next to the crew. The gearbox and transmission shaft were located on the right side and not under the crew compartment, allowing the designers to bypass one of the biggest flaws of this concept – excessive height. The suspension was not made from scratch either, the developers used the one from Renault VO. The prototype was armed with a pair of machineguns. 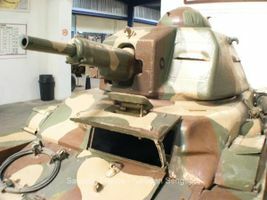 The initial turret design (the turret was designed to be armed with a gun) resembled a hemisphere, shifted to the right of the vehicle axis, but the Renault engineers concluded after running some numbers that this setup would leave too little space inside. They overhauled the turret completely, an effort which resulted in a completely different design, resembling that of the Renault VM – only it used casting. Crew hatches were located on the back and on the top of the turret. The vehicle with this new turret underwent trials in the December of 1934, surpassing all competition – it’s true though that the requirements changed by that time already a bit. Because Renault was already working on a prototype by the time the specs were changed, the initial Renault ZM prototype was based on the original specs. 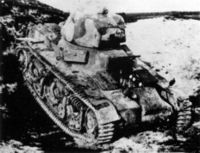 Renault did not bother to build another prototype – instead, they introduced on 20.12.1934 the reworked first prototype with 30mm armor to the appropriate military committee. Only the turret was made thicker (to 40mm), resulting in a weight increase from 6 to 7.5 tons. After the demonstration, additional changes were made to the prototype – for example, mudguards were installed and the exhaust muffler was moved from the back of the hull to the left side. The main change however was the new turret, installed on the vehicle in early 1935. It was developed by the engineers from APX (Ateliers de Puteaux), another important arms-making company. APX initially intended to present a 6-ton prototype light tank of its own, but failed to secure the funding for building of a prototype. This did not prevent APX from funding it on its own and on 18.4.1934 the APX engineers unveiled their APX-R turret. It was this turret that was eventually mated to the Renault ZM prototype. It was considerably better than Renault’s own design, but – what was more important – carried an armament based on the later specs: one 37mm SA18 gun and one MAC Mle.1931 MG.
One thing that needs to be discussed separately is the tanks armament. The thing is, the SA18 gun, used on the Renault FT light tank, was already obsolete by 1926. The reasons why this gun appeared on this new vehicle were purely economic ones. The first reason was that the notoriously underfunded French infantry branch had to save money on practically everything, even on the metal for new tanks production. This was in fact one of the reasons for the appearance of what was basically just an improved version of Renault FT with thicker armor but in roughly the same weight category. The second reason was that there was a very large number of these guns produced and they were used in the obsolete FT’s. When in 1934 the French started re-arming the FT’s with MAC Mle.1931 machineguns, they didn’t re-arm only the machinegun variants but also the FT variants that carried guns before that. That left them with thousands of “free” guns. At the same time, those Renault FT’s that were too worn-out were phased out as well for scrap. This process also became a source of “free” guns. Eventually, the weight of the vehicle was increased even more, something that naturally had influence on its mobility. And finally, another big issue of the vehicle was the fact that it was actually really short, which meant that it had trouble crossing even average-sized trenches. This was eventually “solved” the same way it was nearly two decades ago – the vehicle received a “tail”, the same kind the Renault FT was equipped with. Regardless of these issues, the modified Renault ZM became the victor of the design competition – not that it was that great of a feat, mind you: Hotchkiss (the same company that was at the birth of the competition for next French light infantry tank) gave up and left the contest and all the other competitors were even worse compared to Renault’s design, requiring many changes and fixes to be suitable. Under the circumstances, the Infantry Command had no choice but to declare Renault the winner. Renault ZM was thus on 29.4.1935 accepted officially in service under the designation of Char léger Modèle 1935 R.
The first production run was to consist of 300 vehicles that had registration numbers starting with 50001. Another production run followed and the French infantry finally received the long-awaited replacement for the obsolete Renault FTs. In the meanwhile however, the vehicle suffered from more issues than just weak armament. Due to the changes made to the vehicle, the initial weight of 6 tons was actually increased to almost 11 tons. The original engine – 85hp Renault 447 – was sufficient to make the original variant mobile, but for nearly 5 extra tons it was woefully inadequate with only 7.7 hp/t. Another issue turned out to be the suspension, originally developed for a cavalry tankette and more suitable for plains and hard surfaces than rough terrain. It clearly had trouble during off-road driving – five roadwheels were obviously not enough, the suspension itself had trouble crossing various ditches and other obstacles. Regardless, the total number of R35s produced was 1540 vehicles. The military actually ordered even more (1800 + 500 immediately after the war began) but these plans were never realized due to complicated circumstances. 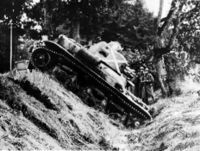 The Infantry Command partially “woke up” in 1937 and realized that the Renault R35 wasn’t exactly the best thing on the battlefield. They did not miss the lessons learned from the Spanish Civil War, lessons that would positively haunt them in the future. It turned out that during the war, large numbers of anti-tank guns were used by both sides, especially the German 37mm PaK. In the June of 1937, one R35 underwent firing trials where it was fired at from at first a 25mm AT gun and then from the 37mm PaK. The results were – to put it mildly – a nasty surprise. The tests have clearly shown that armor thickness by itself cannot guarantee solid protection. The issue with cast armor was that when compared to rolled armor plates of equal thickness, their durability was 10-15 percent lower. From 18 shots by 37mm PaK, 14 ended in penetrations. Neither the hull nor the turret posed a serious problem to the German gun. What was even worse however was the fact that out of 22 shots from the French 25mm AT gun, 13 also ended in penetrations. It’s no wonder that after such unexpected results, the French Infantry Comnmand started paying much more attention to the FCM 36 – although this vehicle was twice as expensive, it was protected by welded and well-sloped rolled armor plates. In addition to that, the FCM suspension turned out to be more suitable for off-road terrain. But the deed was already done and under the circumstances there was no time for significant changes. Even though the FCM 36 would have been nice, it was also expensive and the production capacities of Forges et Chantiers de la Méditerranée were limited. 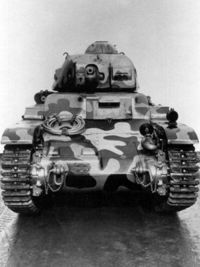 Even Renault itself had issues with fulfilling the military contract, as a result of which the French Infantry Command also ordered 100 Hotchkiss H35 tanks (a roughly similar vehicle to R35). 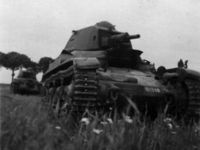 One of the most common solutions was – after the production of 1350 APX-R turrets – to equip the R35 tanks with FCM turret, originally used on FCM 36, which was considerable more protected than the original APX-R. Another issue came up however. With the constant increases in armor, the French suddenly realized that the old SA18 gun cannot penetrate even light tanks on the battlefield. The answer to that was the rushed development of 37mm SA38, penetrating 29mm of armor at 100 meters. Of course, that was too little even for 1938 (by this time, the Germans started producing tanks with 30mm frontal armor) but it was nevertheless more than SA18′s 20mm penetration. Another thing that was later found out was the fact that the welds of the FCM turret would break under intensive shelling. As a result of these two factors, it was decided to install the new gun into the old APX-R turret. True, even this change took quite long, because apart from the R35, the H35 and H39 tanks by Hotchkiss also required the same re-arming. As a result, the SA38 became available for the R35 only at the end of its production run. One of the tanks that received this new gun was the vehicle registration number 51295. From that number alone, it’s possible to make the conclusion that there were fewer than 250 of these re-armed R35s in total. It’s however likely that there were even fewer than that – the analysis of photoghraphs shows that approximately one half of the vehicles produced after number 51295 were armed with the SA18 still. 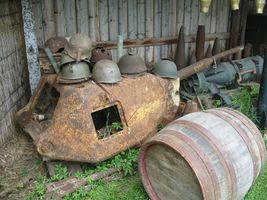 The results of the obsolete French tank doctrine (based on First World War) became obvious during the French campaign of the Second World War. 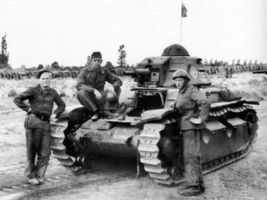 Interestingly enough, the first soldiers to actually try the R35s in battle were the Polish – the Polish army received 50 such vehicles, but for a number of reasons (including insufficient training) the results of these vehicles in Polish service during the Polish campaign were very poor. A part of these vehicles were captured by the Germans and the Red Army in working condition. Generally it can be said that the Polish 7TP tanks had higher combat value as they were more mobile and were able to penetrate any German tanks of that period. As for the results of the R35 in France – the R35 was the most common French tank during WW2 (with the exception of the completely obsolete Renault FT), but it was a war it was not ready or suitable for. There were no massive attacks of hundreds of small light tanks against fixed lines like they were in WW1, and the enemy the R35 had to fight was highly mobile. 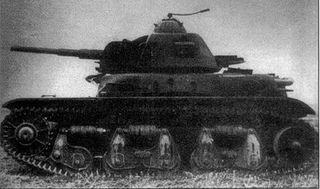 The tank battalions equipped with R35s were mostly static with little hanging on their performance. An improved version, the Renault R40, was developed to address these shortcomings. The main issue was the suspension, as the R35's was designed for a much lighter tank. The R40 had a new suspension system developed by AMX with 12 road wheels per side as well as the 37mm SA38 gun. This new suspension allowed for much greater off-road performance. At least 130 were built, starting in March 1940. None survive to this day. 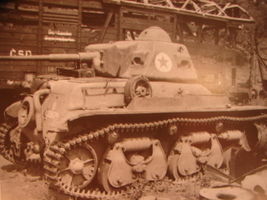 A Renault R35 tank on display at King Ferdinand National Military Museum, Bucharest. * One of its historical armaments, the 45 mm 20K gun, is missing. This modification was used by the Romanian Armed Forces. The 25 mm Canon Raccourci mle. 1934 was never fitted to the Renault R35. This page was last modified on 13 October 2018, at 11:14.